While living abroad and acquiring another language it is absolutely necessary to become infatuated with the language and culture being learned. It will likely be a result of your interest as opposed to an active decision to become enamored. You can't help it, you just fall in love. When living in Chile I became fond of a store called Casa & Ideas, which carried many common household goods, such as Bed Bath and Beyond, but with a bit less of the bath and bed, and more of the 'beyond'. 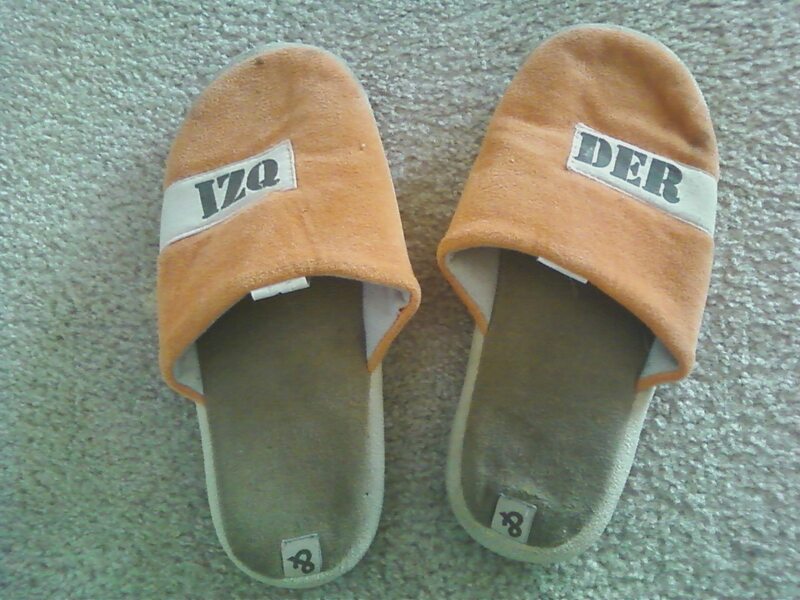 I purchased these slippers, having abbreviations of the words 'izquierdo' and 'derecho', both adjectives following the word 'pie', such as pie izquierdo and pie derecho, meaning 'left foot' and 'right foot' in Spanish. This was the coolest thing to me since I was in love with Spanish, so I bought them immediately. An interesting fact about the word 'izquierdo/a' is that it has its origins in Basque, or Euskera, the language of the Basque people in Northern Spain. What's really great about this language is that it is a language isolate, which is a fancy way of saying 'Where does it come from? We do not know.' It is broken down as follows, esku (hand, From Basque) and kerros (Celtic word, meaning 'twisted'). The left hand has long since been the 'worthless hand' and been associated with all sorts of bad; not surprising considering that 'derecho' in Spanish also means 'right, or correct'. Apparently the Latin words for 'right' and 'left' are 'dexter' and 'sinister', which are passed down to us in the roots 'skillful' and 'evil'. 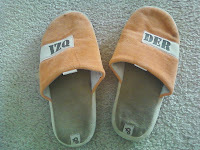 Learning words in foreign languages can be fun and buying simple things--such as slippers--can make it even more exciting. Embodiment of Abstract Concepts: Good and Bad in Right- and Left-Handers, by Daniel Casasanto (Page 353).